I will spend some time this weekend getting ready for HIMSS. The theme for this year's event is "Change Is Everywhere...Opportunity Is Here." Unlike many of my colleagues, I have few parties planned and am trying to keep my schedule fairly flexible. I do have half a dozen important meetings, plenty of chats planned, and lots of people I can't wait to meet in real life. There are a couple parties I've accepted invitations to, and will probably find my way to a few more. But for the me, one overall purpose of attending this event is to participate in the "Meet the Bloggers Event" at the Social Media Center, and also to hear some of the great keynote addresses, while making important connections and hopefully seeing some very interesting product launches. I've been offered a couple behind the scenes looks at some new products, so expect some interesting information to come from the event. I expect some of the scheduled highlights (besides the social media events) to be Wednesday March 3, when both Federal CTO Aneesh Chopra and National Coordinator for Health Information Technology David Blumenthal, MD, MPP, will give keynote addresses. There are also going to be quite a few ONC staffers on hand and even some folks from CMS. This year is likely the biggest year for health IT in history, and there is certainly quite a bit of interest in meaningful use of EHRs, HIE, RECs, SHARP, Beacon Communities and on and on. I expect this HIMSS will have a distinct government focus mingled in with the usual private sector thrust. The most frequent error in medicine seems to occur nearly one out of three times a patient is referred to a specialist. A new study found that nearly a third of patients age 65 and older referred to a specialist are not scheduled for appointments and therefore do not receive the treatment their primary care doctor intended. According to a new study appearing in the February 2010 issue of the Journal of Evaluation in Clinical Practice (available on line), only 71 percent of patients age 65 or older who are referred to a specialist are actually scheduled to be seen by that physician. Furthermore, only 70 percent of those with an appointment actually went to the specialist's office. Thus, only 50 percent (70 percent of 71 percent) of those referred to a specialist had the opportunity to receive the treatment their primary care doctor intended them to have, according to the findings by researchers from the Regenstrief Institute and the Indiana University School of Medicine. Better information systems are likely to improve several aspects of care. For clinicians, systems can be designed to identify multiple orders or appointments. Systems can provide more effective training about referrals, more complete clinical information and better tools for decision support and documentation. Communication systems are also critical for effective referral. Systems for electronic messaging between primary- and secondary-care clinicians can be especially useful. Walter Reed Army Medical Center implemented an 'Ask a Doc' system based on electronic mail, with average response times to specialty consultation of less than 1 day. Although messaging systems help, referrers and specialty consultants benefit from talking personally and agreeing on goals. "Patients fail to complete referrals with specialists for a variety of reasons, including those that the health care system can correct, such as failure of the primary care doctor's office to make the appointment; failure of the specialist's office to receive the request for a consultation—which can be caused by something as simple as a fax machine without paper – or a failure to confirm availability with the patient," said Michael Weiner M.D., M.P.H., first author of the study. "There will always be reasons – health issues or lack of transportation, for example – why a referred patient cannot make it to the specialist he or she needs, but there are many problems we found to be correctable using health information technology to provide more coordinated and patient-focused care. Using electronic medical records and other health IT to address the malfunction of the referral process, we were able to reduce the 50 percent lack of completion of referrals rate to less than 20 percent, a significant decrease in the medical error rate," said Dr. Weiner. "This is not necessarily the fault of patients or doctors alone, but it may take both working together – along with their health system – to correct this problem. Our study highlights how enormous a problem this is for patients who were not getting the specialized care they needed. Although our findings would likely differ among institutions, unfortunately overall trends are similar in other parts of the country" said Dr. Weiner. Dr. Weiner is director of the Regenstrief Institute's Health Services Research Program, director of the Indiana University Center for Health Services and Outcomes Research, and director of the VA Health Services Research and Development Center of Excellence on Implementing Evidence-Based Practice at the Roudebush VA Medical Center. Co-authors of the study are Anthony J. Perkins, M.S., of the Regenstrief Institute and the IU Center for Aging Research, and Christopher M. Callahan, M.D., a Regenstrief Institute investigator and Cornelius and Yvonne Pettinga Professor in Aging Research at the IU School of Medicine. Dr. Callahan is founding director of the IU Center for Aging Research. The Regenstrief Institute and the IU School of Medicine are located on the campus of Indiana University-Purdue University Indianapolis. A paralyzed patient implanted with a brain-computer interface device has allowed scientists to determine the relationship between brain waves and attention. Characteristic activity patterns known as beta and delta oscillations have been observed in various regions of the brain since the early 20th century, and have been theoretically associated with attention. The unique opportunity to record directly from a human subject's motor cortex allowed University of Chicago researchers to investigate this relationship more thoroughly than ever before. "This gave us a really unique opportunity to record, at the micro scale, signals from the human motor cortex," said Nicholas Hatsopoulos, PhD, professor in the Department of Organismal Biology and Anatomy and Chair of the Committee on Computational Neuroscience. The experiments, published this week in the journal Neuron, reveal the intricate dynamics of the attentive brain. Beta oscillations can be read as a reflection of how much attention a subject is paying to the task at hand, while slower delta oscillations act as an internal metronome, allowing the brain to anticipate moments when attention is most needed. "Our study shows that when a person can count at a rhythm provided by an external stimulus, your brain can act as a metronome to take advantage of this timing and become more efficient," said Maryam Saleh, graduate student in the Committee on Computational Neuroscience and lead author of the study. The experimental subject was implanted with a BrainGate neuroprosthetic implant in 2006, a device that allows quadriplegic individuals to control a computer cursor using brain activity. As part of a clinical trial, a small chip containing nearly 100 microelectrodes was implanted in the subject's primary motor cortex, where electrical signals could be translated by computer into cursor motion directed by the patient's thoughts. In the experiments described in Neuron, Saleh and colleagues from the laboratory of Nicholas Hatsopoulos recorded electrical activity, called local field potentials, collected by the implanted chip as the subject performed a simple computer task. The subject was shown a series of five instructions of where to move a cursor, but told to only follow the second or fourth instruction and disregard the rest. The recordings found a characteristic pattern of activity as the subject paid close attention to the task. High-frequency beta oscillations increased in strength as the subject waited for the relevant instruction, with peaks of activity occurring just before each instructional cue. After receiving the relevant instruction and before the subject moved the cursor, the beta oscillation intensity fell dramatically to lower levels through the remaining, irrelevant instructions. "Previously, no one has been able to dissociate if beta oscillations are related to attention or to just holding, waiting to initiate movement," Saleh said. "Our results show that these oscillations are tied to the anticipation of oncoming information that is used to make a movement." The slower delta oscillation also showed a regular pattern as the subject performed the task, adjusting its frequency to mirror the timing of each instructional cue. The authors suggest that this "internal metronome" function may help fine-tune beta oscillations, so that maximum attention is paid at the appropriate time. "There are lots of stimuli in the world that have rhythm," said Jacob Reimer, post-doctoral researcher at Baylor College of Medicine and another author of the study." If you're waiting for a signal that is informative, you could pay attention constantly for a long period of time. But if that thing you're waiting for has some rhythmicity to it, maybe a more efficient method is to only pay attention 'on the beat.'" For example, when someone is playing tennis or basketball, the brain may utilize the rhythm of a volley or a dribble to better attune its attention and motor response. To make this fine-tuning possible, electrical oscillations at different frequencies in cortex may play off each other like the instruments of a jazz band. "The slow rhythm is kind of like the rhythm section, and you anticipate notes at particular moments in time based on that slower rhythm." Hatsopoulos explained. This new understanding of the relationship between brain activity and attention may have relevance in the field of neuropsychology, where EEG recordings are able to pick up beta and delta oscillations with reduced spatial resolution. A diagnostic and therapeutic tool could be developed that uses such recordings to assess a person's attention from moment to moment, Hatsopoulos speculated, with the signal fed back to the person to improve their attention. The rhythmic patterns of oscillations may also be useful in developing better brain-machine interface technology for quadriplegic individuals to operate prosthetics, Saleh said. "The brain-computer interface is meant to help a person move a cursor with his thoughts about movement," Saleh said. "But when a person is 'plugged into' a brain-computer interface, he doesn't always want to use it; occasionally, he might just want to tune out and do nothing. Using features from these oscillations, the computer can determine when a patient is ready to move." The ability to understand the role these oscillations play in the motor cortex of humans was "unbelievably valuable," said Charles Schroeder, a professor of psychiatry at Columbia University College of Physicians and Surgeons who has previously studied low-frequency oscillations in cortex. "All these things converge on this idea that low-frequency oscillations reflect the brain's plans; they are really critical," Schroeder said. "Understanding the oscillatory dynamics of cortex helps you think about how you can develop therapies that help the cortex learn or re-learn after damage." The paper, "Fast and Slow Oscillations in Human Primary Motor Cortex Predict Oncoming Behaviorally Relevant Cues," will appear in the February 25, 2010 issue of Neuron. Other authors on the paper include Richard Penn of Rush University Medical Center and Catherine L. Ojakangas of the University of Chicago. March 29th Adoption/Certification Workgroup, 10 a.m. to 12 p.m./Eastern Time. March 31st Clinical Quality Workgroup, 10 a.m. to 12 p.m./Eastern Time. HHS will create a new interagency task force to improve and coordinate how the government implements health information technology. In a memo to 6 federal agencies (http://www.whitehouse.gov/sites/default/files/omb/assets/memoranda_2010/m10-10.pdf), HHS secretary Kathleen Sebelius and HHS director Peter Orszag write that this new task force will replace the existing health IT interagency group. “This legacy structure is not a good fit for the new environment” that includes the ONC, two FACA's, and “increased congressional engagement, and attention from a diverse body of interests in the private and public sectors,” the memo stated. The task force will include the departments of Agriculture, Commerce, Defense and Veterans Affairs, and the Social Security Administration, the Office of Personnel Management and the federal chief information officer and federal chief technology officer. "The purpose of the HIT Task Force will be to assist with policy development, coordination and implementation of Federal HIT activities, as well as to improve transparency of federal government activities related to HIT and communication among federal agencies as they execute federal HIT policy," says the memo. "The HIT Task Force would also have several working groups defined at the first meeting to address a variety of HIT issue areas in more detail. These areas would focus on subjects where coordination among the agencies is essential to policy implementation... It is anticipated that the working groups would be open to individuals from all Federal agencies, giving them the opportunity to participate in these groups." The memo says the purpose of limiting the task force to the eight agencies is that they want to "provide a forum for the key agencies who are the primary producers, consumers, and implementers of HIT in the federal government, while opening up the working groups to all federal agencies allows for a broad participation across the government on specific HIT issues. We believe it imperative that policy and technical representation be integrated in these communities, so that the efforts of both can be fully informed and coordinated." Agencies must designate a senior leader to serve on the interagency task force by Feb. 26. I will post more information on this group as it becomes available. We suggest you call in early as lines are limited. The study, to be published the week of February 22 in the early edition of the Proceedings of the National Academy of Sciences, adds new insight to a highly controversial question: What is intelligence, and how can we measure it? The brain regions important for general intelligence are found in several specific places (orange regions shown on the brain on the left). Looking inside the brain reveals the connections between these regions, which are particularly important to general intelligence. In the image on the right, the brain has been made partly transparent. The big orange regions in the right image are connections (like cables) that connect the specific brain regions in the image on the left. Other coauthors on the paper, "The distributed neural system for general intelligence revealed by lesion mapping," are David Rudrauf and Daniel Tranel of the University of Iowa; Roberto Colom of the Autonomous University of Madrid; Lynn Paul of Caltech; and Hanna Damasio of USC. The work at Caltech was funded by the National Institutes of Health, the Simons Foundation, the Deutsche Akademie der Naturforscher Leopoldina, and a Global Center of Excellence grant from the Japanese government. Healthcare reform efforts are inside the twenty yard line with less than two minutes to go. 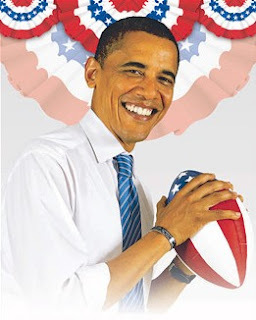 President Obama has been trying to guide his team through a difficult and slippery first three quarters of attempting to make a touchdown on healthcare reform, and so far their is no score. There have been fumbles, fouls, and dropped balls, and what sometimes seemed hot dogs on his own side not playing as a team. I have said before that I believe the President will propose his own reform package this fall, and I think after he addresses Congress this week we will see the Whitehouse developing their own bill. So far they have resisted taking positions on many specific elements of a the House and Senate healthcare bills, instead expressing openness to different ideas, while allowing Congress to go its own way. But this approach has left many lawmakers divided over some of the more controversial elements, such as how to control costs. Since many Americans seem to favor of a slower, less ambitious approach, the President is moving towards a proposal that might bear his name and could carry serious political risks. But it is time for Mr Obama to take the ball and run with it. The biggest obstacle is overcoming opposition to a public option, which the President would prefer, but has said is not absolutely necessary. One idea that he may favor has been proposed by by Sen. Olympia J. Snowe (R-Maine) is the concept of a "trigger" in which a government run program would be implemented only if private insurers were unable to deliver affordable insurance plans to most consumers within three to five years. This is the same type of "trigger" used in the Bush-sponsored Medicare prescription drug law. So far, the government drug coverage has not been needed. "If somehow the private market doesn't respond the way that it's supposed to, then it would trigger a public option or a government-run option, but only as a fail-safe backstop to the process," Sen. Ben Nelson (D-Nebraska) said on CNN's "State of the Union" program. "And when I say trigger, you know, out here in Nebraska, in the Midwest, I don't mean a hair trigger." The "Gang of Six" is still working on a plan that would included an insurance co-op, and there is still the possibility that the President may allow some form of tort reform and the ability for health insurance to be purchased across state lines into the bill. An incremental approach with three or four bills may be another way forward, instead of going for everything at once. The lessons of the past will not be lost on this administration, and perhaps it might be time for thinking of settling for a field goal instead of driving for the end zone. Complete contact information can be found on my more extensive list - we are making progress! The President has unveiled the Whitehouse proposal for health reform. There are a few points where there is common ground with the Republican agenda. Comprehensive Sanctions Database. The President’s Proposal establishes a comprehensive Medicare and Medicaid sanctions database, overseen by the HHS Inspector General. This database will provide a central storage location, allowing for law enforcement access to information related to past sanctions on health care providers, suppliers and related entities. Registration and Background Checks of Billing Agencies and Individuals. In an effort to decrease dishonest billing practices in the Medicare program, the President’s Proposal will assist in reducing the number of individuals and agencies with a history of fraudulent activities participating in Federal health care programs. It ensures that entities that bill for Medicare on behalf of providers are in good standing. It also strengthens the Secretary’s ability to exclude from Medicare individuals who knowingly submit false or fraudulent claims. Expanded Access to the Healthcare Integrity and Protection Data Bank. Increasing access to the health care integrity data bank will improve coordination and information sharing in anti-fraud efforts. The President’s Proposal broadens access to the data bank to quality control and peer review organizations and private plans that are involved in furnishing items or services reimbursed by Federal health care program. It includes criminal penalties for misuse. Liability of Medicare Administrative Contractors for Claims Submitted by Excluded Providers. In attacking fraud, it is critical to ensure the contractors that are paying claims are doing their utmost to ensure excluded providers do not receive Medicare payments. Therefore, the President’s Proposal provision holds Medicare Administrative Contractors accountable for Federal payment for individuals or entities excluded from the Federal programs or items or services for which payment is denied. Community Mental Health Centers. The President’s Proposal ensures that individuals have access to comprehensive mental health services in the community setting, but strengthens standards for facilities that seek reimbursement as community mental health centers by ensuring these facilities are not taking advantage of Medicare patients or the taxpayers. Limiting Debt Discharge in Bankruptcies of Fraudulent Health Care Providers or Suppliers. The President’s Proposal will assist in recovering overpayments made to providers and suppliers and return such funds to the Medicare Trust Fund. It prevents fraudulent health care providers from discharging through bankruptcy amounts due to the Secretary from overpayments. Use of Technology for Real-Time Data Review. The President’s Proposal speeds access to claims data to identify potentially fraudulent payments more quickly. It establishes a system for using technology to provide real-time data analysis of claim and payments under public programs to identify and stop waste, fraud and abuse. Illegal Distribution of a Medicare or Medicaid Beneficiary Identification or Billing Privileges. Fraudulent billing to Medicare and Medicaid programs costs taxpayers millions of dollars each year. Individuals looking to gain access to a beneficiary’s personal information approach Medicare and Medicaid beneficiaries with false incentives. Many beneficiaries unwittingly give over this personal information without ever receiving promised services. The President’s Proposal adds strong sanctions, including jail time, for individuals who purchase, sell or distribute Medicare beneficiary identification numbers or billing privileges under Medicare or Medicaid – if done knowingly, intentionally, and with intent to defraud. Study of Universal Product Numbers Claims Forms for Selected Items and Services Under the Medicare Program. The President’s Proposal requires HHS to study and issue a report to Congress that examines the costs and benefits of assigning universal product numbers (UPNs) to selected items and services reimbursed under Medicare. The report must examine whether UPNs could help improve the efficient operation of Medicare and its ability to detect fraud and abuse. HHS has allocated an initial $50 million to be invested in establishing the national Health IT Research Center (HITRC). The HITRC will gather relevant information on effective practices from a wide variety of sources across the country and help the Regional Extension Centers (RECs) collaborate with one another and with relevant stakeholders to identify and share best practices in EHR adoption, effective use, and provider support. The HITRC will build a virtual community of shared learning to advance best practices that support providers’ adoption and meaningful use of EHRs. I imagine this is going to use kind kind of social media component that will allow real time collaboration. The legislation states the HITRC will assemble and disseminate materials to support and address the needs of all prioritized providers, including but not limited to materials addressing the unique needs of providers serving Native Americans, persons with limited proficiency in the English language, persons with disabilities, and other historically underserved populations, as well as those that serve patients with maternal, child, and behavioral health needs. But interpretation of exactly what defines "historically underserved populations" is vague. I hope that rural communities are prioritized because that seems to me to be an area of great need. The first awards for the RECs have been announced and they are beginning to ramp up. The RECs will become members of a consortium that will be coordinated and facilitated by the HITRC. Research and analysis of best practices regarding health IT utilization rests primarily with the HITRC, dissemination and implementation of those best practices learned from the HITRC will rest with the regional centers. Federal CTO Aneesh Chopra announced on the FACA Blog that on March 8, 2010 the Implementation Workgroup of the Health IT Standards Committee will hold a public hearing on “Implementation Starter Kit: Lessons and Resources to Accelerate Adoption” to help providers achieve meaningful use by, in part, surfacing examples of effective meaningful use implementation preparation. He is asking us to post questions and comments about implementation opportunities and challenges we are facing today and for which we would either like to share or would welcome support. Unfortunately the response so far has been underwhelming. I would encourage everyone to consider posting some real life examples so we are not operating in a theoretical world but with actual experiences to develop best practices. Considering the timing of the needs for the HITRC to develop best practices and this upcoming Implementation Workgroup meeting, I imagine that these stories could become templates that would be used to create effective adoption and implementation strategies. Every EHR implementation has a story to tell - it may be a wonderful example, or it could be a terrible warning. But now is the time to make your voice heard. EHR adoption rate in U.S. physician practices is 36.1 percent, a 3.2 percent increase over one year ago, according to a report from health IT company SK&A, a Cegedim company. As healthcare providers make preparations to implement EHR solutions and qualify for federal incentives outlined in the American Recovery and Reinvestment Act of 2009, SK&A, A Cegedim Company, today released its updated "Physician Office Usage of Electronic Healthcare Records Software" report, which shows a 36.1% EHR adoption rate in U.S. medical offices -- a 3.2% increase since the February 2009 version of the study. Like its predecessor study, the latest report identifies physician adoption rates by office size, practice size, practice specialties, patient volume, ownership, geography and other variables. This updated study also measures the level of software functionality available to and being utilized by physicians in medical offices to support the government's newly defined "meaningful use" criteria. -- Physicians primarily use EHR systems for electronic notes (28.3%), as opposed to electronic labs/x-rays and electronic prescribing. -- EHR adoption rates increase as the number of physicians, number of exam rooms and daily patient volume rise. -- EHR adoption is more prevalent in hospital- or health system-owned sites. Hospital-owned and health-system-owned sites have adoption rates of 44.1% and 50.2%, respectively. On the contrary, non-hospital-owned and non-health-system-owned sites have adoption rates of 34.4% and 34.2%, respectively. -- The specialty areas with the highest adoption rates include dialysis, critical care medicine and radiology. Those specialties with the lowest adoption rates include allergy/immunology, general surgery and general practice. The HIT Policy Committee gathered for its second meeting of the year on February 17th in Washington, DC. The majority of the meeting time was dedicated to discussing recommendations of the Meaningful Use Notice of Proposed Rulemaking (NPRM) and Standards and Certification Interim Final Rule (IFR). Four Committee workgroups presented recommendations for the existing criteria, to better enable the electronic health records (EHR) incentive program to achieve its objectives and facilitate progress toward the ultimate goal of improving health and health care of all Americans. The Meaningful Use Workgroup began by laying out a series of 12 recommendations, including proposals to make progress note documentation a part of the Stage 1 meaningful use definition and to allow eligible providers a certain degree of flexibility in meeting the meaningful use criteria. Next, the Adoption/Certification Workgroup presented comments on eligible provider reporting metrics and interoperability standards. Both the Adoption/Certification and the Health Information Exchange workgroups put forward recommendations regarding the laboratory portions of the NPRM and IFR. Finally, the Privacy and Security Policy Workgroup proposed ways to strengthen existing meaningful use and certification criteria relevant to privacy and security, as well as concerns and future policy and standards priorities. 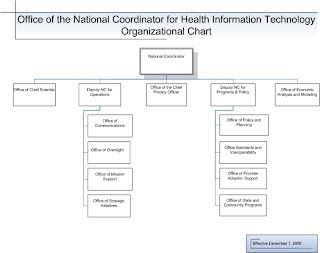 Following dialogue about the NPRM and IFR, the HIT Policy Committee shifted attention to its effort in creating a set of recommendations for the Nationwide Health Information Network (NHIN). The NHIN Workgroup focused the meeting’s discussion on the role of enabling organizations and associated functions and services, encompassing a minimal core set of services and functions needed to support standards-based interoperability along with further services to support additional interoperability at scale. The last segment of the meeting was devoted to reviewing the framework for the Federal Health IT Strategic Plan. The Strategic Planning Workgroup outlined the framework’s vision and four key themes, which center around meaningful use, development and support of a policy and technical infrastructure, incorporation of privacy and security solutions into every phase of health IT adoption and use, and transformation of the current healthcare delivery system into a learning health system. I have been generally very impressed with the efforts at implementation of government 2.0 principles, but here is one area where there needs much greater transparency at the Office of the National Coordinator and this in listing their staff and contractors. To avoid the impression that identities of personnel and contractors are being withheld from the public to prevent the public from knowing who they are and what their past and present affiliations might be, the ONC should immediately release contact information and titles for all the staff. (Update 5/28/10 - much of this information has now been released). HHS does have a listing of public employees. Unfortunately the ONC is not in this list. However, doing some creative searching I was able to create the following list with active links to their contact information pages. But, alas many of the titles are blank, much of the data are outdated, and there seems to still be some missing data.